A Face is our identity. When we look attractive, we feel confident and courageous, ready to face the outside world with a broad smile. But, as time takes its toll, the appearance of dark circles, wrinkles, age lines and creases spoils that impeccable beauty. There are numerous cosmetic and dermatological procedures available to stop the clock of ageing and rejuvenate the skin. Nonetheless, before setting up your mind about any such cosmetic procedures, let us discover a few basics about ageing process and how the cosmetic treatments such as total face anti-ageing treatment can improve the overall look. After all, when it’s your face on the line, one can never be too cautious. 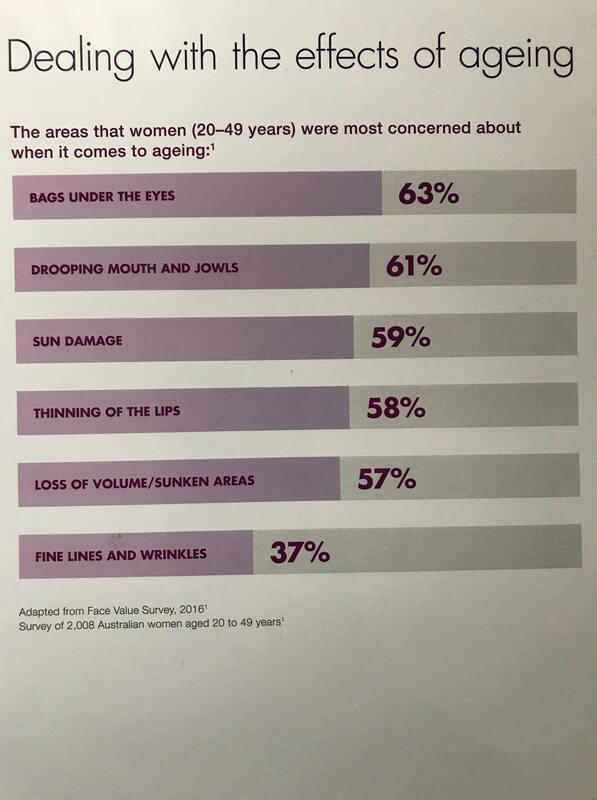 In Australia, statistics show, 63% of women are concerned of their eye bags, 57% of women are worried about volume loss or sunken areas in face and 37% of women find fine lines and wrinkles abysmal. But, why and how do these wrinkles, dark circles, under eye bags and folds occur? At young age, our skin is rich in structural proteins like collagen, elastin, etc. so, even when our facial muscles contract after we make facial expressions, they coil back to the former position. Although with time, the facial muscles weaken, and the structural proteins deplete from our skin, thus making the skin lose its elasticity and suppleness. After that, whenever we make expressions, the facial muscles contract but could not relax back immediately. This leaves behind a trail of imprints which we call dynamic (temporary) wrinkles and fine lines. If not interfered, these dynamic wrinkles convert into static (permanent) lines and wrinkles over time. Again, the youthfulness of face depends largely on the soft fat padding that cushions our cheek, chin and all other facial features. But, as our age multiplies, the volume of the face is reduced due to collagen and fat loss. That is when our cheeks and temples appear bony, our lips look thin and flat, and we develop dark circles, wrinkles and folds. On top of that, due to the effect of gravity, all the mass starts accumulating in the lower face area resulting in the formation of double chin. Therefore, in brief, the ageing of the face means collagen loss/lack of elasticity, weak facial muscles and volume loss. So, for the complete revival of youth and beauty, each of these causes must be individually dealt. For altering the marks of ageing, ultimately, people seek resort in various aesthetic treatments. But, to heal the different ageing symptoms, we require specific anti-ageing treatments as one type of anti-ageing treatment cannot smoothen all types of skin ageing issues. For instance, in case of dynamic wrinkles and lines, anti-wrinkle injections work wonders, whereas, for treatment of dark circles and under eye bags, dermal fillers are the best option. Hence, to obtain a natural-looking, youthful skin, the best approach would be to undergo a combination treatment which involves two or three procedures together for a maximized result. Moreover, if we try to fix or enhance a particular section of the face, there are high chances of annihilating the subtle balance among the facial features, thus, portraying a very fake and unattractive look. So, the focus should be shifted to improving the overall facial appearance with a blend of anti-ageing treatments. 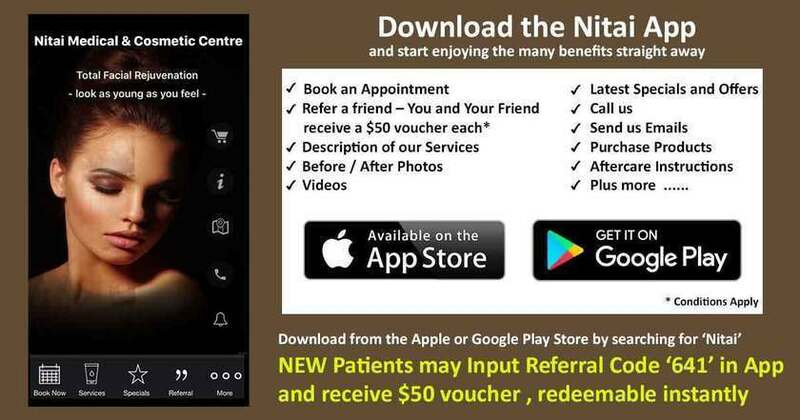 At Nitai Medical and Cosmetic Centre, we understand all those concerns and issues. Hence, we have commenced an innovative anti-ageing treatment called total face, which actively treats the wrinkles, volume loss and double chin.  Replenishing the skin to erase wrinkles, frown lines, folds, dark circles, double chin and as such. This treatment does not overemphasize any feature, it precisely improves the volume and reduces the appearance of creases. The result is a fresh, glamorous look which looks very natural.  Every face is distinct and accordingly, have different requirements. Total face anti-ageing treatment offers flexible customization depending on the type of facial treatments needed. A thorough consultation with a professional cosmetic physician in Melbourne will guide you in tailoring the perfect program for a rejuvenated skin.  Total Face anti-ageing treatment uses premium quality anti-wrinkle injections, dermal fillers and double chin removal injections to provide excellent results that last. Why is total face anti-ageing treatment so effective? Total face unifies three different anti-ageing treatments together to garner enhanced results.  Double chin removal injections are appropriate to remove fullness of chin. Thus, total face effectually rectifies the overall appearance of the face without spoiling the natural balance among the facial features. What is the anti-wrinkle injection used in total face approach? At Nitai Skin Clinic in Melbourne, we use premium quality anti-wrinkle injection, which is a special type of protein synthesized from certain lab cultivated bacteria. The injectable liquid relaxes the specific wrinkle causing muscles, thus, resulting in remarkable reduction of creases from the face.  It starts showing results within the first two days of the treatment and the effect lasts for at least four consecutive months.  As the product has been thoroughly tested, the anti-wrinkle injections used in Nitai Medical and Cosmetic Centre, have minimum risk factors. All known risks are discussed with you prior to any treatment by our experienced cosmetic doctor.  It refreshes the skin without casting a fake, rigid look (must be treated by a professional practitioner). What is the role of Dermal Fillers? Dermal filler injections use artificially synthesized hyaluronic acid that replaces the lost volume in the sunken areas of the face. Apart from that, dermal fillers also help in boosting up the collagen production, thus, renewing the elasticity of the skin and refreshing it from within.  Premium quality dermal fillers last from 1-2 years, specifically depending on the dosage and the treated area.  Facial fillers recover the condition of the skin from within, presenting a plush, wrinkle-free, natural-looking skin.  Since it has very low chances of allergy or inflammation, it is regarded as a product with negligible side-effects. Again, all known risks are discussed prior to any treatment by our cosmetic doctor. How do double chin removal injections help? Double chin removal injections are synthetically created deoxycholic acid that dissolves the extra, unwanted fat accumulating under the chin. Without much pain or irritation, this double chin injection defines the jawline and contours the neck, bestowing grace and beauty.  It is regarded as the first injectable treatment to eradicate the appearance of swollen flesh under the chin.  The effect of the treatment lasts for the next four years and after that also, in most cases, re-treatment is not required.  The advanced double chin treatment is relatively painless (compared to surgical procedures) and does not have severe side-effects. The minor consequences such as subtle pain, redness, swelling, etc. fade away within a week. For any further query on total face anti-ageing treatment or to book an appointment, visit us at www.nitai.com.au.